F. S. 689.01 presents the basic rules for conveying real property in Florida. 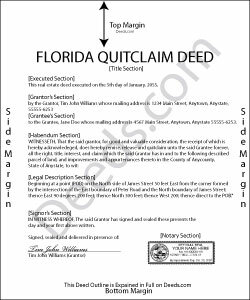 Although quitclaim deeds are not specifically defined in the Florida Statutes, the correct language, modifications, and content work together to create an instrument that legally transfer ownership of land. All quitclaim deeds must be in writing and be signed by the grantor in the presence of two witnesses. In addition to these details, F. S. 689.02 presents the form for a warranty deed. It includes requirements for the date of conveyance; the names, addresses, and counties of both parties (grantor and grantee); the amount of consideration (usually money); and a complete legal description of the property. The statutory form also requests the property appraiser's parcel ID, which should be included if possible, and the grantee's social security number, which may be omitted on documents submitted for recordation and entry into the public record. This basic form also includes warranty covenants, however, which must be deleted and/or changed where appropriate because quit claim deeds do not contain any warranty protection for the grantee. If the real estate described in the quitclaim deed is a homestead, F. S. 689.111 explains that if the grantor is married, both spouses must sign the conveyance whether both have ownership of the property or not. *	Each signature must have the signor's name typed or printed beneath the signature, and each signor's complete mailing address must be in the body of the quit claim deed. In most cases, the addresses are included with the grantor/grantee information. *	Quit claim deeds must contain the name and mailing address of the individual who prepared the document. *	Each witness's signature must have the signor's name typed or printed beneath the signature. *	The quit claim deed must be acknowledged by a notary public or other official authorized to take acknowledgements and administer oaths. *	Specific format: 3" x 3" space at the top right of the first page, 1" around the sides and bottom, 1" x 3" at the top right of all other pages with 1" around the sides and bottom. Florida follows a "notice" recording statute. F. S. 695.01 asserts that conveyances of real property, including quit claim deeds, must be formally recorded according to law, thereby providing notice to the public of a change in ownership of the parcel of land. This means that if the grantor conveys the same property to another bona fide purchaser (buyer of the land for value, usually money), and the earlier deed is not recorded, the later grantee will generally retain ownership. Recording quit claim deeds or other instruments that formalize a change in ownership of property preserves the chain of title (sequence of owners), which simplifies future conveyances. F. S. 695.11 states that instruments submitted for recording to the clerk of circuit court's office are considered to be recorded at the time they are filed. Each document receives a unique, sequential, official register number to identify the order of submission; lower numbers have priority over higher numbers in the same series. F. S. 695.01 goes on to explain that grantees by quit claim are considered "bona fide purchasers without notice within the meaning of the recording acts." This is because quit claim deeds contain no warranties of title. Regardless, the best way to protect the interests of all parties is to record the deed as soon as possible after its execution.